This year again, Klewel is collaborating with the Lift team for webcasting the Lift11 event at the International Convention center of Geneva, Switzerland. Starting our collaboration with Laurent Haug and his team in 2008 for the Lift Venture night, one year later we were in charge of capturing some of the 2009 Lift workshops. Last year in 2010, we provided our webcasting solution and we re-iterate our partnership this year. We look forward to a great event! 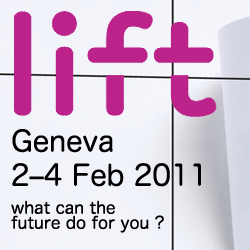 For those of you who do not know Lift conference series try to answer the questions: What can the future do for you? Lift works to identify and anticipate current and emerging usages of digital technologies through research, events, publications and services.